Many recent news stories detail people who are shooting down drones which are flying over their property. My very limited understanding is that shooting the drones down is in general not legal, and some are facing charges for discharging a firearm inside city areas. Most of these people don’t understand that the drone can’t “see everything.” Unless the aerial vehicle is a few feet away, it probably can’t see their wife sunbathing in the backyard. A camera with a long lens or a covertly placed camera phone can gather much more juicy imagery than a noisy flying weedwhacker. But that’s not the point of this article. If your neighbor is flying a drone and you want to bring it down there’s no need for a gun. No need to call the police. No need to freak out. 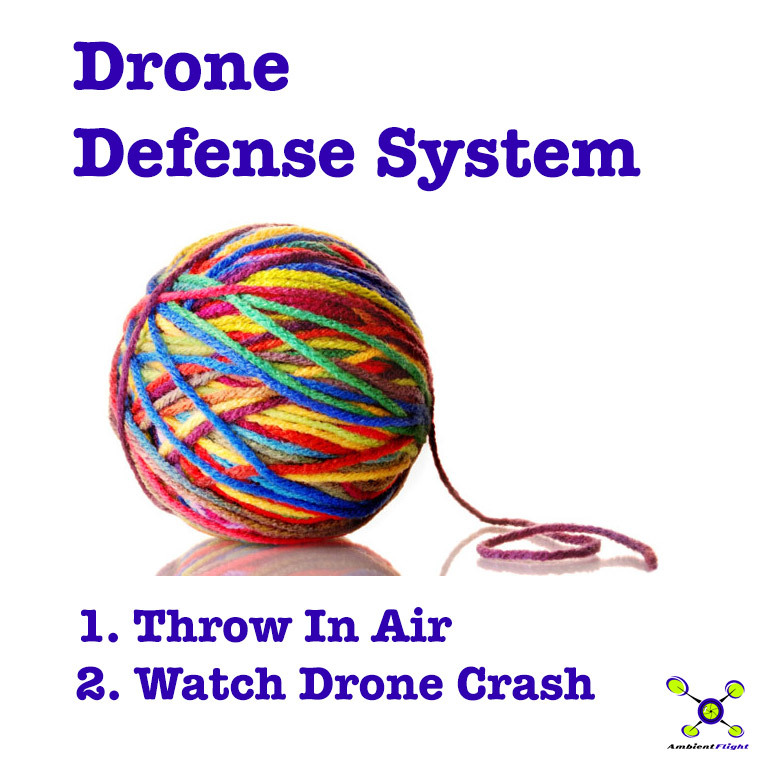 All you need to bring a drone down is a loose ball of yarn. Toss it up in the air and watch the drone come down for an unintentional crash landing. Then you can have a “discussion” with the drone “pilot” about flying over your property, and the “finder’s fee” you’d like to collect to return the pilot’s drone to him/her. If you wish to buy a drone defense system, I have them for sale at $99.99 each with free shipping!